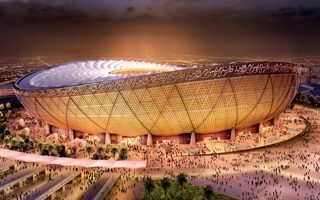 So far only some 500 people have been hired on the site, but eventually up to 7,000 workers will work on delivery of the Arabian Peninsula’s largest stadium! In the northern outskirts of Doha construction has officially begun on the 2022 World Cup’s most crucial venue, the Lusail Iconic Stadium. Not only the largest in Qatar, it will also be the most impressive stadium throughout the Arabian Peninsula. Its location is the massive Stadium Precinct, covering roughly 100 hectares within Lusail, the new smart city created for 200,000 people. Already now the place is surrounded by new roads, while light rail and metro lines are being built as we speak. And since April 11 so is the main stadium! So far the construction site is simple a cleared and sealed off mass of sand with outline of the field drawn in it. But excavation is already ongoing and foundation works should be done later this year. Current employment on site is 500 workers, but at peak it will reach 7,000. Yet, despite such huge number of people, the building will take 3.5 years to build, which means deadline is set for late 2020, two long years before the World Cup. We know the stadium will be stunning in terms of size, even if only by the gross building area of 223,000 m2! What’s unclear as of now is the capacity. The declared net size is 80,000 people, however the Lusail City official website gives 87,000, while a source close to Chinese contractors suggests up to 92,000 seats! We also don’t know the stadium’s final design, it hasn’t been published so far. That said, once we revealed an accidentally found render of the stadium in late November last year, we were contacted by a high-ranking Qatari official asking how we got it. So maybe that’s roughly how the stadium will look indeed? One more thing that we do know is that the building alone is priced at $767 million, while Lusail City as a greater metropolitan project is expected to consume $20 billion or so.